The Maverik Center in West Valley City, home of the Utah Grizzlies ice hockey team. 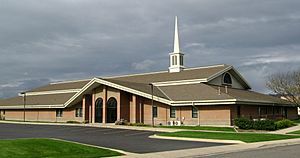 West Valley City is a city in Salt Lake County and a suburb of Salt Lake City in the U.S. state of Utah. The population was 129,480 at the 2010 census, making it the second-largest city in Utah. The city incorporated in 1980 from a large, quickly growing unincorporated area, which was variously known as Granger, Hunter, Chesterfield, and Redwood. It is home to the Maverik Center and USANA Amphitheater. The first European people to live in the area were the Latter-day Saints (Mormons). The Euro-Americans arrived in the Salt Lake Valley in 1847. The area was first staked out by settler Joseph Harker and his family in the area they named as "over Jordan" (referring to the land west of the Jordan River, which runs through the valley). On May 19, 2011, the city unveiled an official plan to create a downtown area for the city over the course of 10 years, building on plans and development that already existed. It will be known as Fairbourne Station (named after Joseph Fairbourne, an early settler who operated a weigh station in the area in the late 19th century) and will consist of approximately 40 acres (16 ha), costing $500 million to build. The center will include a civic center (consisting of city hall, a courthouse, police headquarters, and a library), an eight-story Embassy Suites hotel, a plaza, and residential development, as well as the end of the TRAX Green Line, and a stop on the 3500 South MAX bus rapid transit line. Valley Fair Mall and the Maverik Center are located nearby, as is I-215. As of 2016[update] of the development is incomplete, with the TRAX line having opened in 2011 and the hotel in 2012, but the City Hall and government center are under construction. According to the United States Census Bureau, the city has a total area of 35.5 square miles (91.8 km²) of which 35.4 square miles (91.7 km²) is land and 0.1 square miles (0.2 km²) (0.17%) is water. West Valley is located on the northwest side of the Salt Lake Valley between Salt Lake City on the north, South Salt Lake on the east, Magna Township on the west, and Taylorsville and Kearns Township on the south. The Oquirrh Mountains loom over the city to the west, while the Jordan River marks the eastern boundary. The fire department responds to more than 10,000 calls for service each year. WVFD is dispatched by Salt Lake Valley Emergency Communications Center. In the city, the population was spread out with 33.7% under the age of 18, 12.9% from 18 to 24, 30.7% from 25 to 44, 17.4% from 45 to 64, and 5.4% who were 65 years of age or older. The median age was 27 years. For every 100 females there were 102.3 males. For every 100 females age 18 and over, there were 100.5 males. A stake center of The Church of Jesus Christ of Latter-day Saints in West Valley, Utah. The West Valley Central Green Line station. 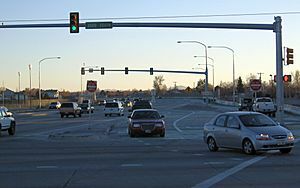 A continuous-flow intersection on the Bangerter Highway in West Valley City. West Valley City is on the same address grid system as Salt Lake City, and therefore also follows the same street numbering system. I-215 runs through eastern portions of the city parallel to I-15, which lies farther east of the city. The SR-201 freeway lies along the northern border with Salt Lake City and continues west into Magna as an expressway. Bangerter Highway, which runs south from Salt Lake City International Airport, traverses the approximate center of the city as well on its way to serving the rapidly growing western and southern ends of the valley. The Mountain View Corridor will also run through the western portion of the city. 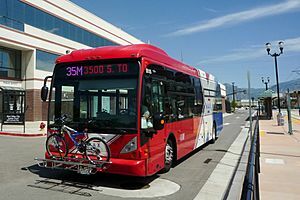 The city also is served by several bus routes operated by the Utah Transit Authority, and an intermodal transportation hub located in the city center near Valley Fair Mall and the Maverik Center. In addition to local bus routes, the West Valley Intermodal Hub is serviced by TRAX light rail and MAX bus rapid transit (BRT) lines. The 3500 South MAX BRT line began service in 2008 and the TRAX Green Line to the intermodal hub was completed and began service in 2011. 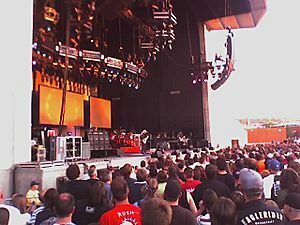 Rush playing at the USANA Amphitheatre in 2007. West Valley City is home to the Maverik Center and the Utah Grizzlies of the ECHL. It is also home to the Utah Cultural Celebration Center, Stonebridge Golf Course, Westridge Golf Course, Rocky Mountain Raceways, USANA Amphitheatre, Hale Centre Theatre, and the Valley Fair Mall. WVC is also home to The Drive-in. The Eastern side of West Valley City consists of the Redwood, Chesterfield and East Granger neighborhoods. The neighborhood population in 2013 was 54,832. This area of West Valley City has a median household income of $42,512, which is lower when compared to the rest of the city and region. The neighborhood's racial makeup was 51.17% White, 35.08% Hispanic or Latino, 4.73% Asian, 3.24% Native Hawaiian and Other Pacific Islander and 2.51% African-American. Much of Eastern West Valley's residential architecture is based on common brick ranch styles from the 1960s and 1970s. To the north of Parkway Boulevard exists a significant number of light industrial development. South of Parkway is mostly residential and commercial, including Valley Fair Mall and the Maverik Center. West Valley City planners are currently developing a planned mass-transit anchored Downtown area near the Valley Fair Mall with the emergence of the Fairbourne Station as a gathering place and revitalization of the mall. The Central portion of West Valley City consists of the West Granger and Hunter, south of 3100 South, with the Lakepark and Westlake Business Park commercial and office developments taking up the majority of the space north of 3100 South. The neighborhood population in 2013 was 49,107. This area of West Valley City has a median household income of $55,087, which is typical for the state of Utah and Northern Salt Lake County. The neighborhood's racial makeup was 53.82% White, 32.11% Hispanic or Latino, 5.04% Asian, 4.54% Native Hawaiian and Other Pacific Islander and 1.57% African-American. Much of Central West Valley's residential architecture is based on common brick ranch styles from the 1960s and 1970s. The Highbury planned development is currently being established in the northwestern portion of this area. This is a large planned mixed residential and commercial area with a large pond and many casual restaurants in a walk-able district near 5600 West. The western portion of West Valley City consists of the West Hunter, Woodhaven, and Oquirrh neighborhoods. The neighborhood population in 2013 was 28,475. This area of West Valley City has a median household income of $64,356, which is slightly higher than the median for both the state of Utah and Salt Lake County. The neighborhood's racial makeup was 60.65% White, 29.62% Hispanic or Latino, 3.15% Asian, 2.37% Native Hawaiian and Other Pacific Islander and 1.39% African-American. Much of western West Valley's residential architecture is based on 1990s and 2000s planned developments. The majority of the neighborhood is residential, with the exception of many strip-mall style commercial developments along its eastern border of 5600 West. The city's master plan calls for a Hunter Town Center development near the intersection of 5600 West and 3500 South, but no structures have yet been developed specifically for this. This side of West Valley City is also home to USANA Amphitheater, though it technically shares the 84118 zip code with Kearns and Taylorsville, rather than West Valley City. West Valley City has presented the Key to the city to several visiting dignitaries. Past recipients have included Mayor Yeah Samake of Ouelessebougou, Mali; Governor of Chiapas Juan Sabines Guerrero; and United States Secretary of State Hillary Clinton. The key was awarded to Tongan Queen Mother Halaevalu Mataʻaho ʻAhomeʻe on July 28, 2011, when she visited the city for the rededication of the Tongan United Methodist Church. It was also presented by Mayor Mike Winder on December 14, 2011 to Axl Rose of Guns N' Roses when they performed in the Maverik Center the day after it was announced that the band was to be inducted into the Rock and Roll Hall of Fame. West Valley City, Utah Facts for Kids. Kiddle Encyclopedia.